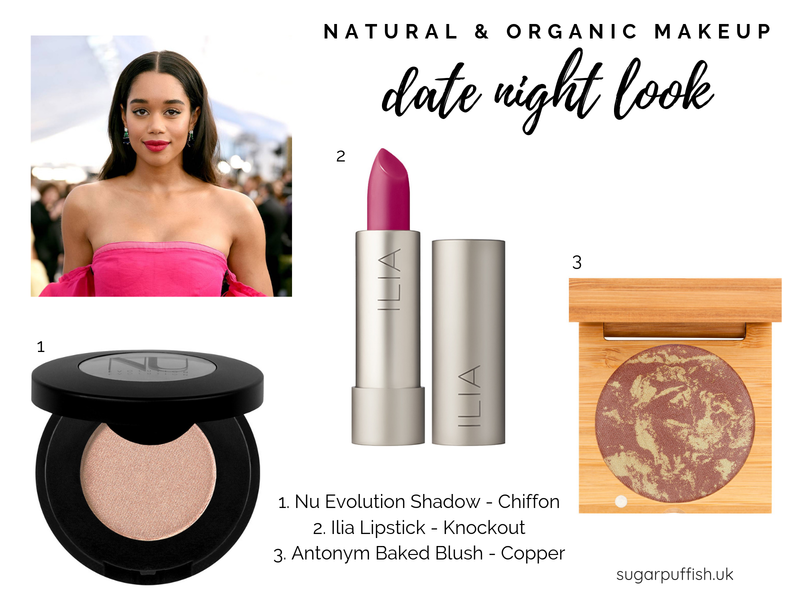 Last year I put together a date night look using Reese Witherspoon as my inspiration and the year before it was Zooey Deschanel. This time around I've chosen Laura Harrier mainly because I adore her fuchsia lipstick. Apparently she's wearing Chanel Rouge Allure Velvet in Infrarose but lets see if we can create a similar look with alternative green brands that are natural and cruelty free. Laura's makeup look is all about the bold lip colour and I've had a fun tracking down similar colours. My first choice would be Ilia Colour Block High Impact Lipstick Knockout (bold magenta), followed by Antipodes Lipstick Dragon Fruit Pink (vivid pink) and Ere Perez Olive Oil Lipstick First Date (berry magenta). If you prefer gloss then look to 100% Pure Lip Caramel in Cherry Cordial (bold fuchsia) and Ere Perez Beetroot Cheek & Lip Tint in Fun (Bright fuchsia pink). For a polished red carpet look then a strong brow frames the face. Lavera Eyebrow Styling Gel styles and cares for the brows whilst adding colour. The Inika Brow Define Palette contains transparent brow wax and a light and dark brow powder (available in Amber or Chesnut). With a bright lipstick you'll probably want to do for a neutral eye look so I like the look for Ere Perez Eye Palette in Pretty and Nu Evolution pressed shadows in Chiffon or St Tropez. With an understates eye colour you definitely need a fluttery lash and Pacifica Dream Big Las Extending Mascara seems a good option. Laura's cheeks look fresh and natural, with a hint of highlight and definition. I've selected a handful of products which I think could achieve this look. The Antonym Cosmetics Baked Blush have a beautiful swirl of colour with options to suit different skin tones (Cooper for medium to dark skin tones). Nui Cosmetics Cream blush in Pititi is a soft matte rose and pair that with Ere Perez vanilla highlighter. The Lily Lolo Cheek Duo in Coralista contains is a matte coral blush and light reflecting highlighter. If you would like to shop the products mentioned they are available at *Love Lula, Naturisimo, and *Content Beauty.